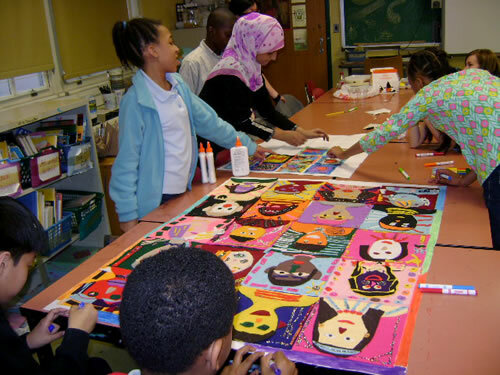 Dominguez’ entire artistic career has also been dedicated to Arts in Education for students K/12 grades in the NYC Board of Education system. 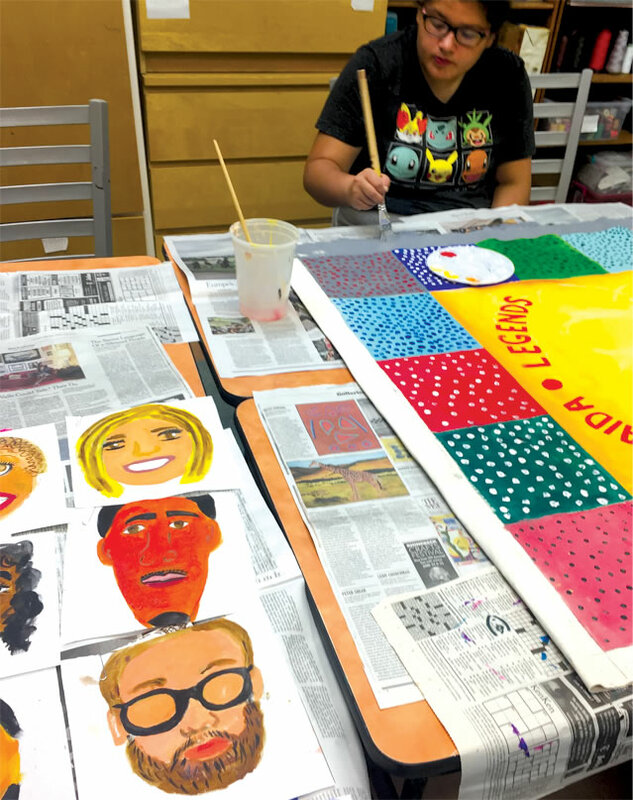 Her experience stretches back to 1990 starting with The Guggenheim Museum’s; Learning Through the Arts program, Studio in the Schools in NYC and several other organizations. 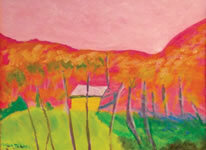 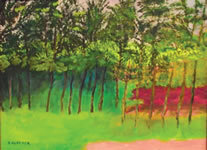 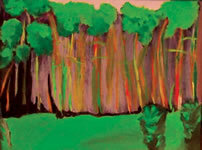 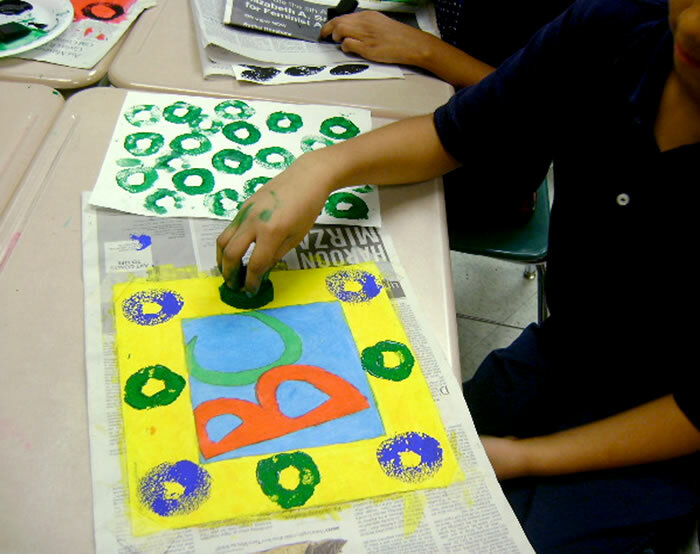 This trajectory garnered her the position of Director of the Education Department for El Museo del Barrio in 1994. 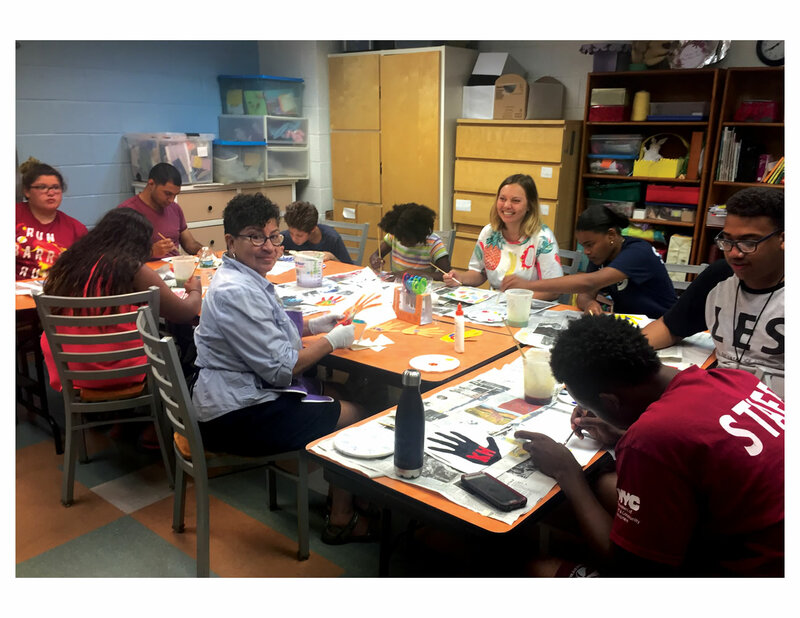 After a 10 year tenure there she returned to the classroom working for Young Audiences of New York, Community Works and City Lore while also engaging in community workshops such as The Osborne Association and Local 237. 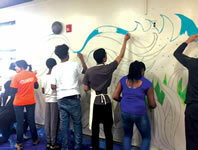 While Dominguez was being surveyed for the project If These Walls Could Speak, Dr. Raquel Ortiz-Rodriquez directed a documentary in 2012, under the auspices of The Center for Puerto Rican Studies, Hunter College, NYC, entitled - Memories on the Wall: Education and Enrichment through Community Murals, recorded by Richard Unapanta. 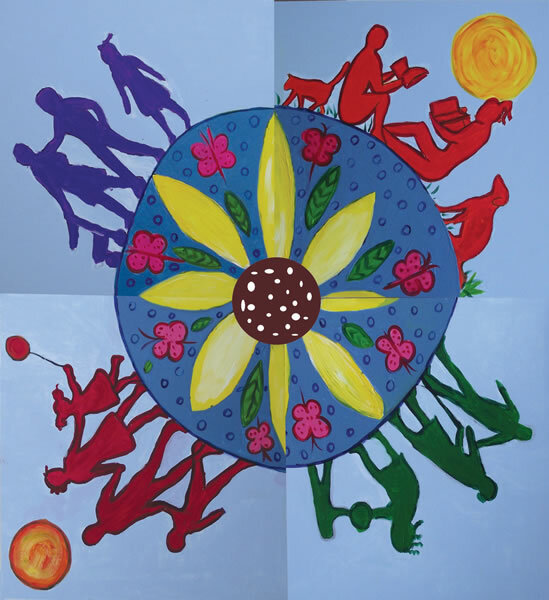 Puerto Rican Voices: Season 3 Episode 7 (María Domínguez) from Center for Puerto Rican Studies on Vimeo. 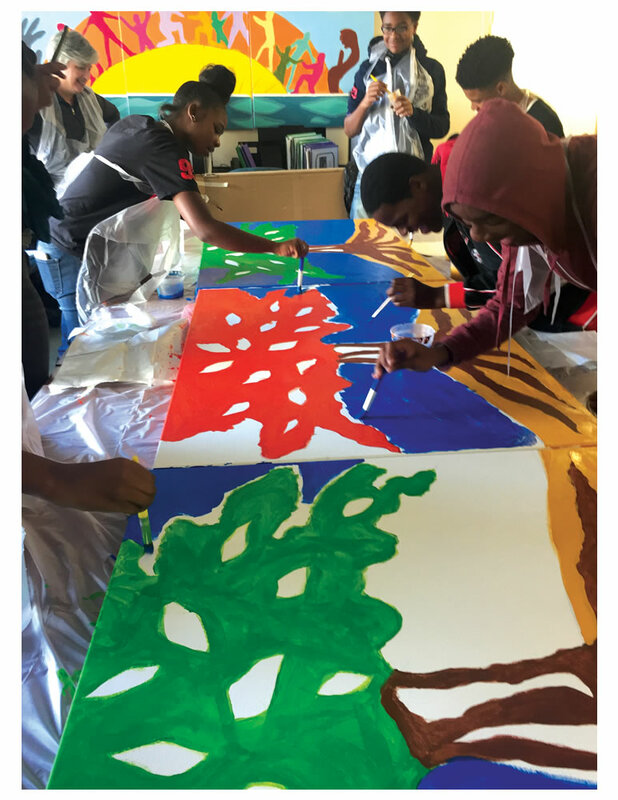 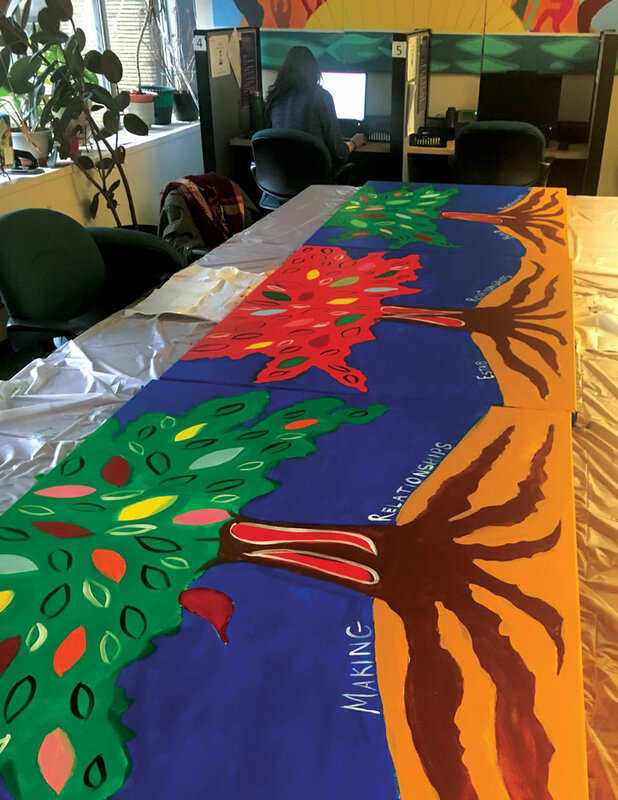 In August 2017 Dominguez was commissioned by Vision Urbana, a Lower East Side organization, to engage 15 teens from their Cornerstone Teen Center in a tapestry-making workshop. 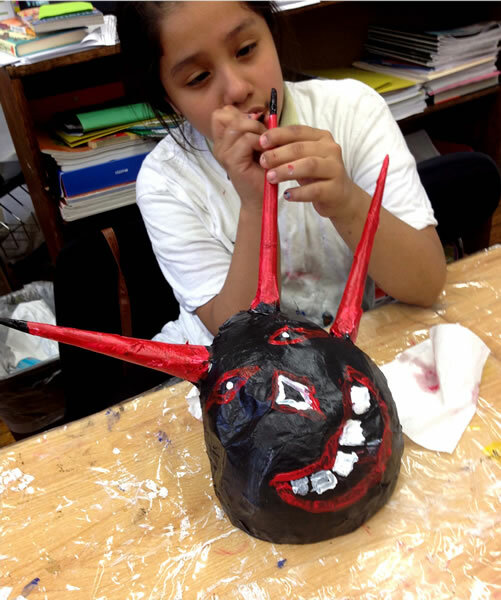 During ten sessions Dominguez lead them in a historical exploration of Lower East Side leaders who contributed and impacted the Latino culture in the area. 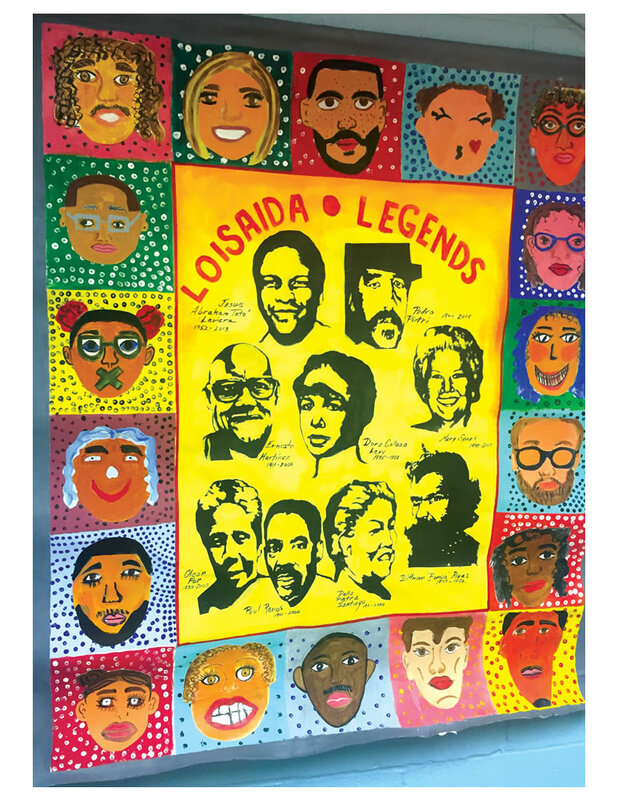 “Loisaida Legacies” tapestry was made possible through a generous grant from The Lower Manhattan Cultural Council it will now grace Vision Urbana’s office. 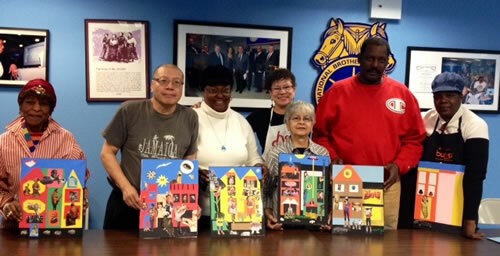 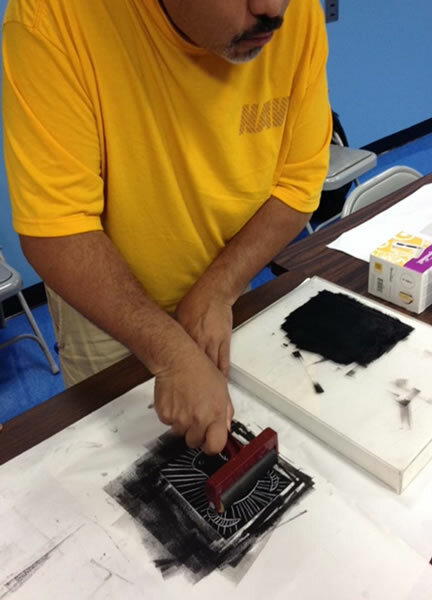 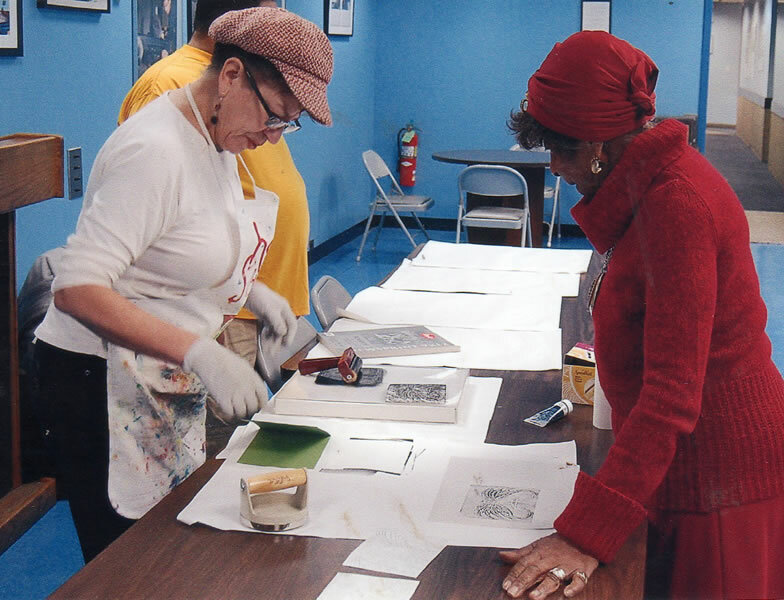 "Retired From Work, Not From The Union"
From 2013 – 2014 Maria Dominguez immersed a group of retirees in a professional art making experience which ranged from collage, painting and printmaking. Artist they observed and for the painting classes included American artist Georgia O’Keefe and German born artist Wolf Kahn. 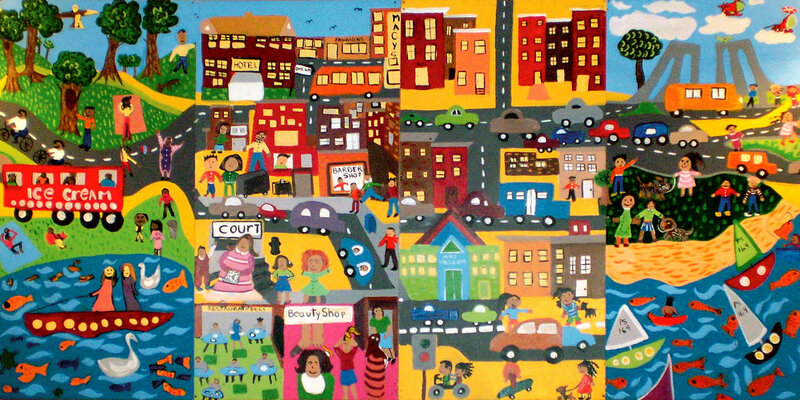 Over 100,000 children in New York State have a parent currently in prison or jail. 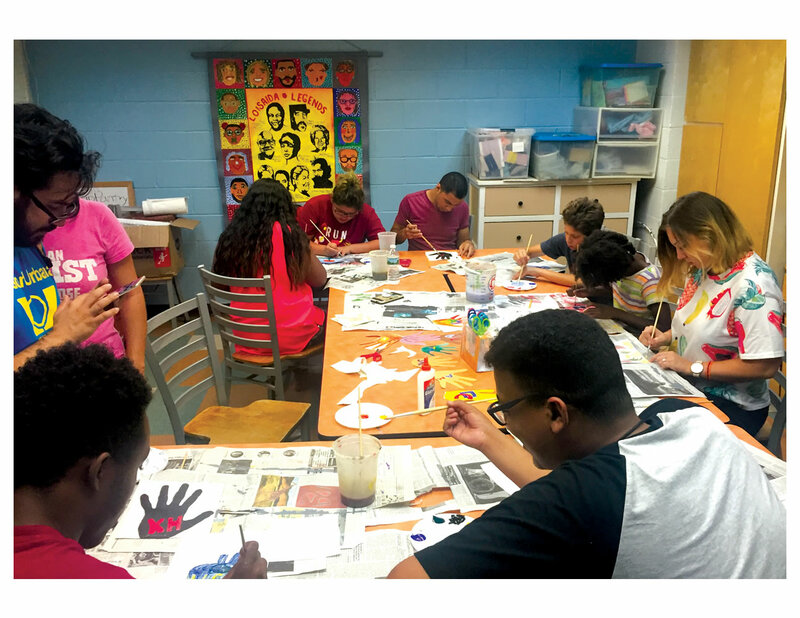 This is an invisible population at high risk due to their parent’s absence and other challenges that often preceded the incarceration. 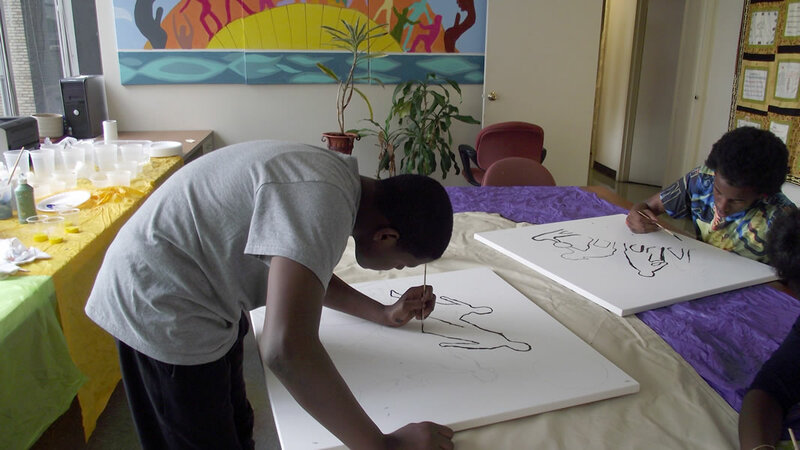 Osborne’s Children and Youth Services (CYS) believes that with support, children with incarcerated parents can succeed and fulfill their potential just as all children can with support, and that they are not and should not be defined or limited by their parents’ choices. 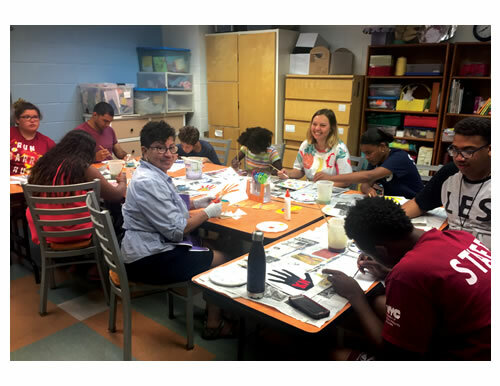 CYS helps children with a currently or formerly incarcerated parent to overcome stigma and isolation by offering a strengths-based, non-judgmental, child-friendly environment, along with support, various services, and resources tailored to these children’s unique needs and perspectives. Dominguez is currently an Artist in Residence for this unique organization and has conducted Summer-Camp workshops as well hands-on activities on a regular basis with staff, children, teens and volunteers. 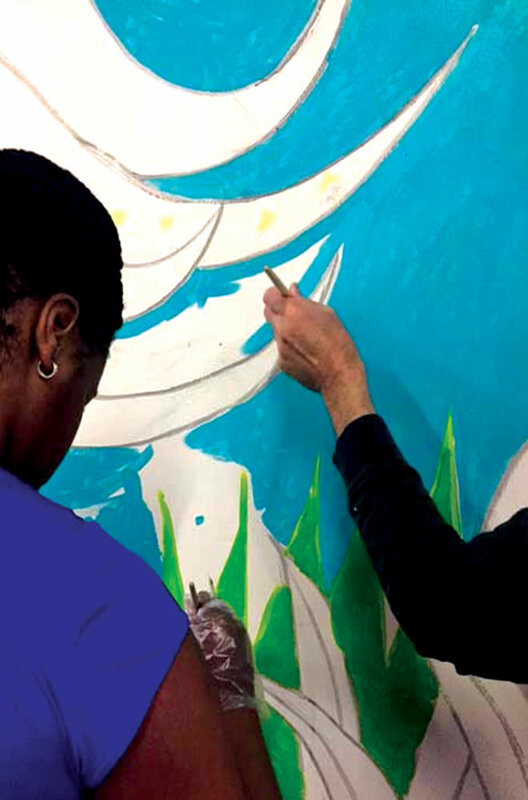 Together they have created works of art that now cover their office walls bringing joy to an otherwise somber environment. 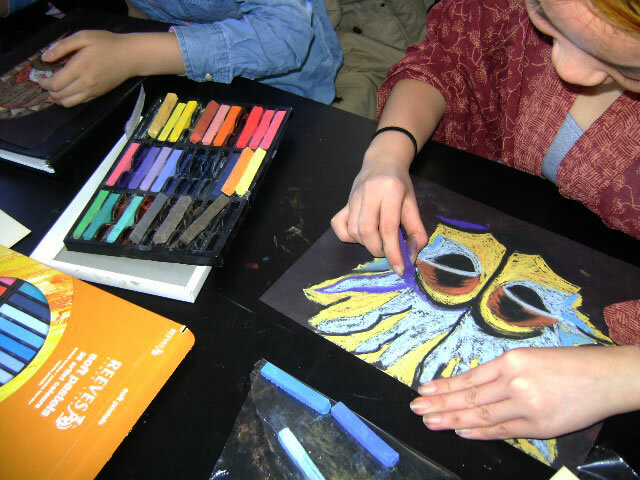 City Lore runs a rich and varied education program, combining in-depth arts-in-education programs with national outreach. 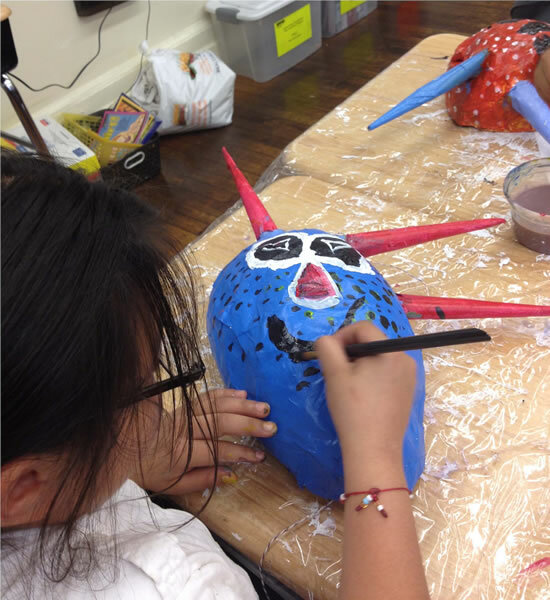 In New York City their programs highlight the immigrant traditions and histories of many cultures represented in the schools. 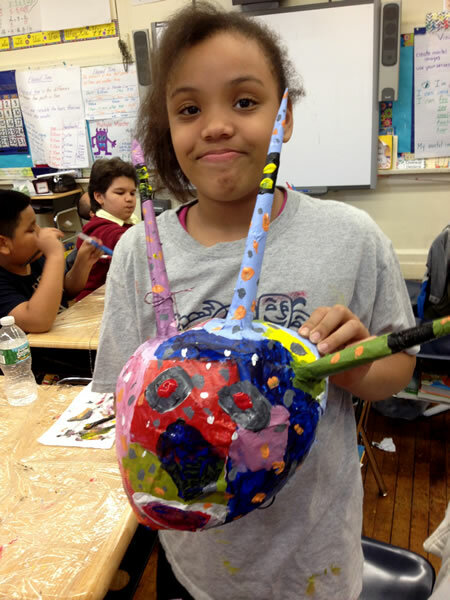 As an Artist in Residence Dominguez entered the MS 21 in Queens under the NATIONS in Neighborhoods program and along with students explored countries in Africa. 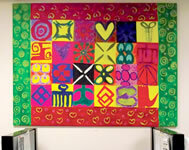 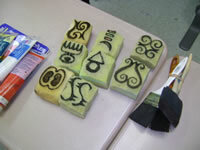 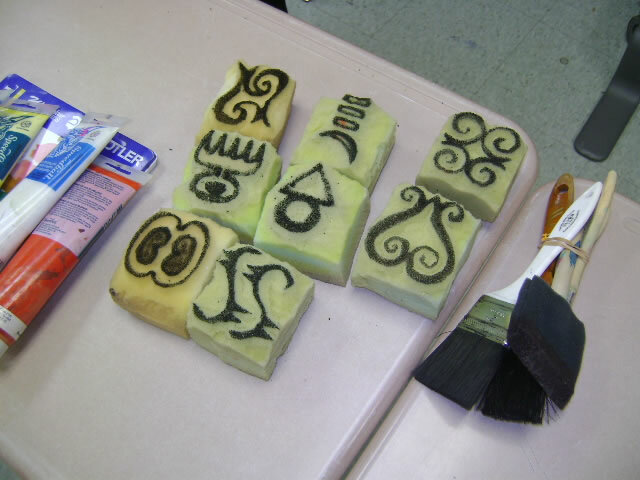 Students in 2 classes created individual textile designs based on traditional Adinkra textile designs created Ghana. 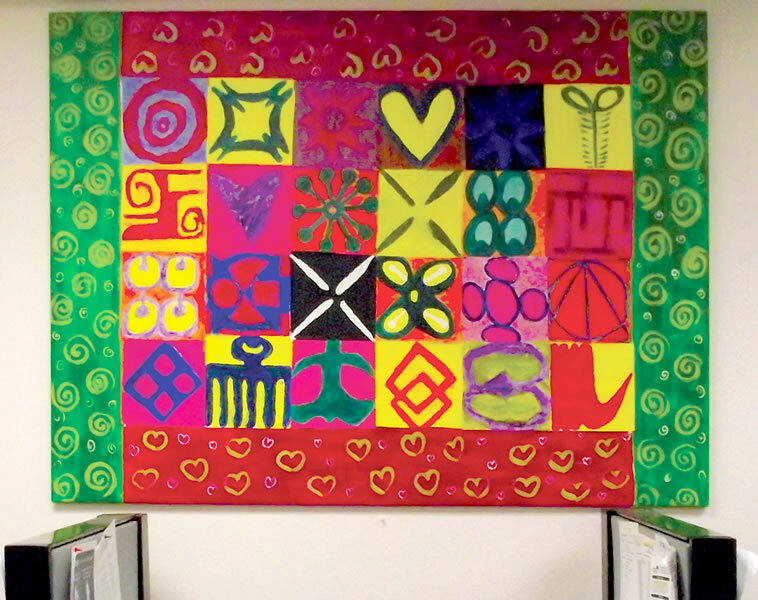 Students began by exploring Adrinka textiles and looking at the work of visual artist Yinka Shonibare who is known for his exploration of colonialism within the contemporary context of globalization by creating installations that are exhibited throughout. 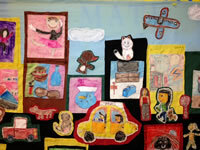 Students concentrated and made connections with immigrants and their contributions to NYC. 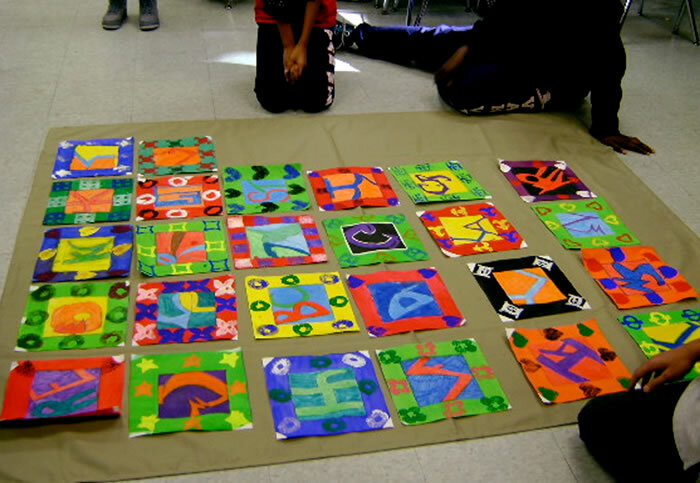 Visiting artist N’KETIAH HUBERT BRAKO HI APA introduced them to the materials and together were painted/printed on fabric our own Adinkra Quilt. 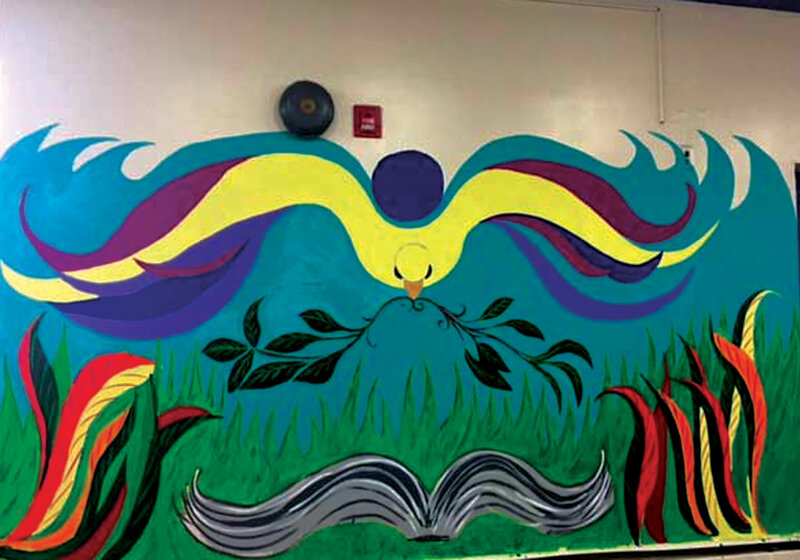 The program also sponsored at PS 10 in Woodside Queens “New York Fusion” mural two 11’ x 5’ murals to beautify their stair well first floor landing. 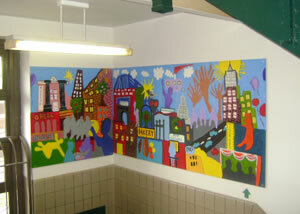 The theme concentrated on immigrants and their contributions to New York City. 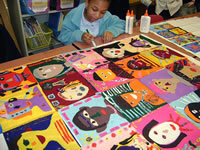 Young Audiences of New York (YANY) one of New York City’s oldest and most well respected arts education organizations. 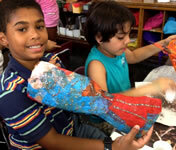 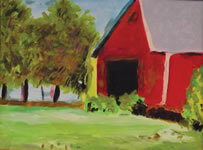 Their school programs connect highly skilled teaching artists in schools and communities throughout the country. 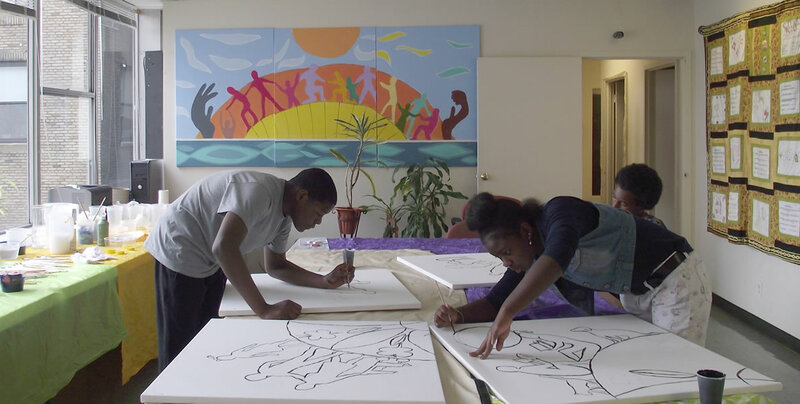 They take pride in understanding their partner’s objectives and needs and fulfilling those goals with diverse programming. Dominguez engaged High School students with no art background from The Manhattan Comprehensive Night and Day High School in the creation of portfolio pieces by using drawing mediums only. 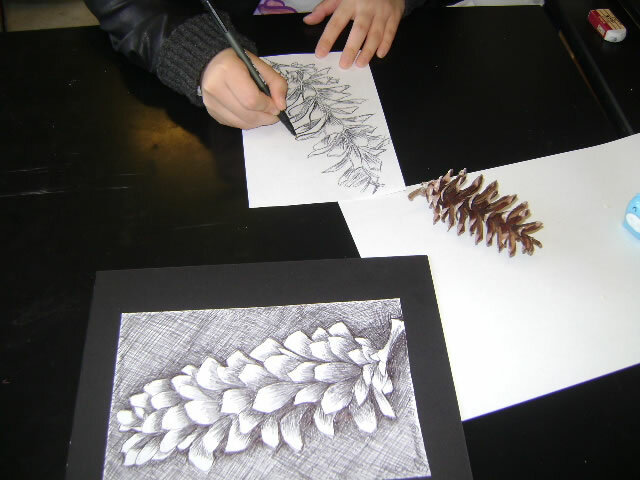 Students were able to manipulate different drawing mediums such as; pencils, charcoal, chalk pastels, oil pastels and ink. 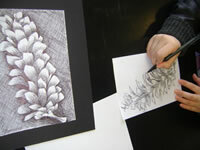 By using these they understood what “still life” drawings were. 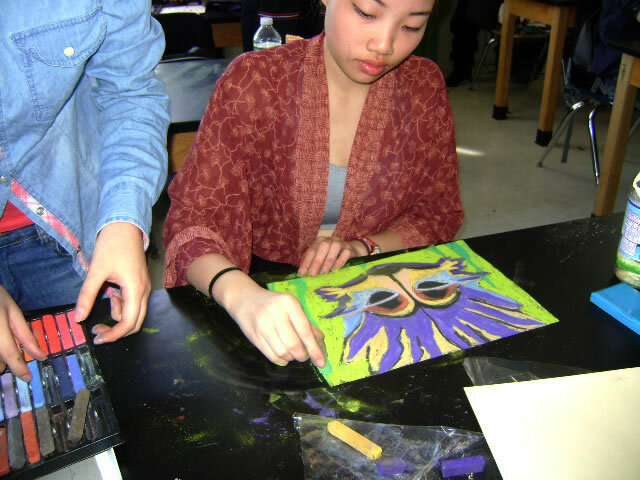 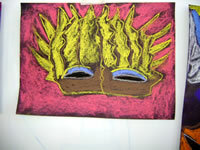 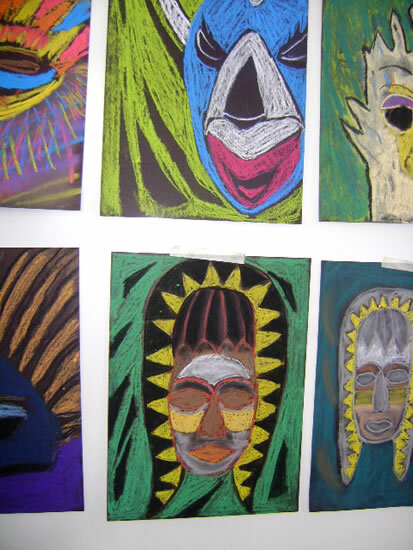 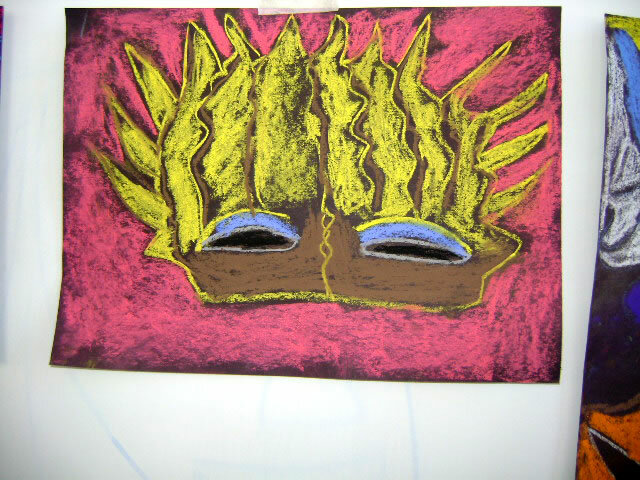 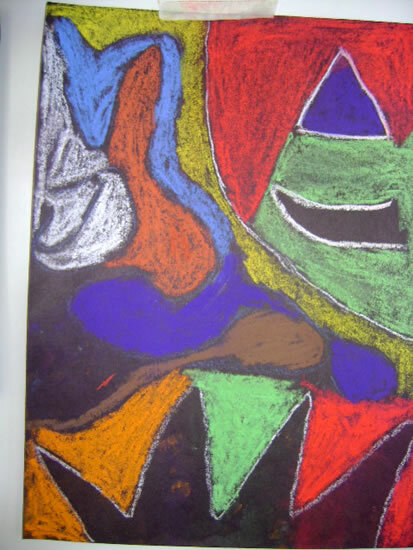 One-session students drew masks from different world cultures by using color chalk pastels on black paper to create sophisticated works of arts. 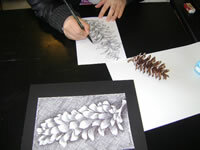 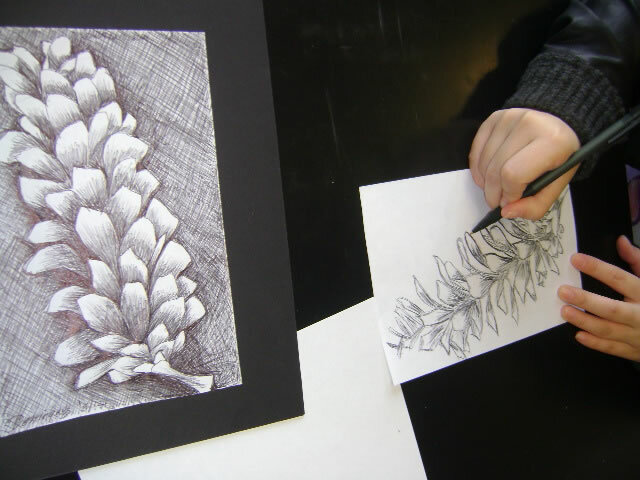 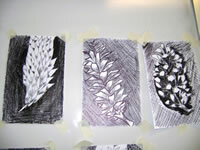 Another session they use pen and ink to draw a pinecone for this final session. 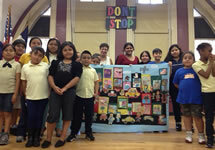 Later the students celebrated their accomplishments with an exhibit of their work where the community was invited. 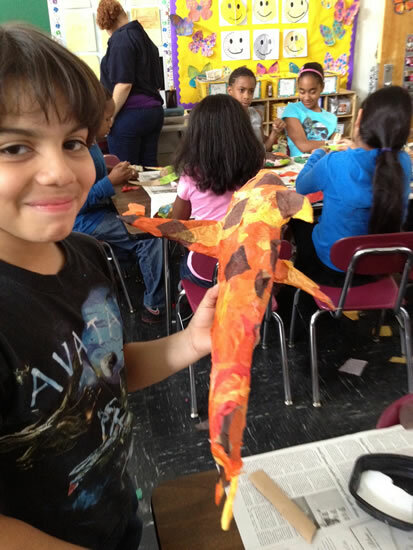 In PS 130 Dominguez guided young 4th grades in Brooklyn in the creation of three-dimensional objects. 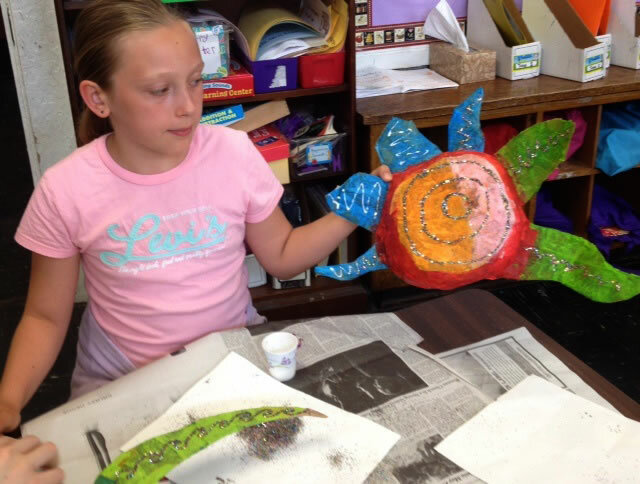 The10 week session lead the students to understand how their drawings of imaginary animals could be molded with wire, newspaper and cardboard into sculptural pieces to decorate their classroom. 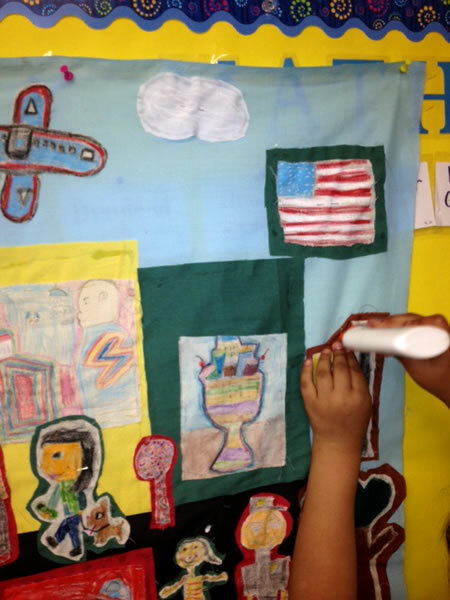 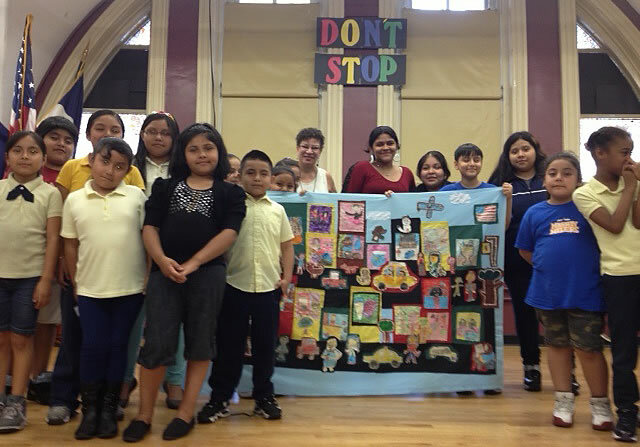 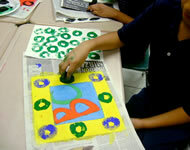 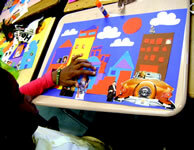 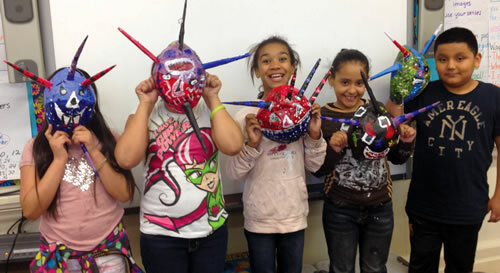 Third graders in PS 164, also in Brooklyn, to created artwork, which would eventually lead to A Day in Brooklyn mural. 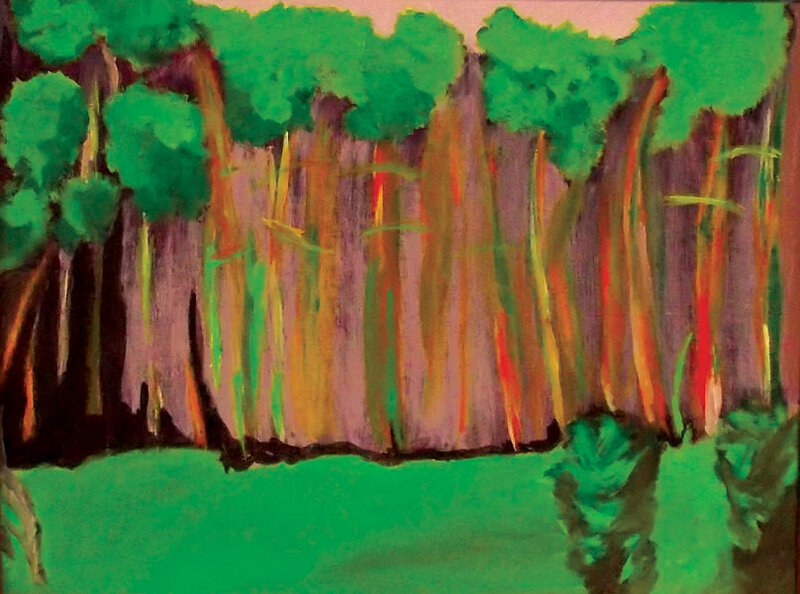 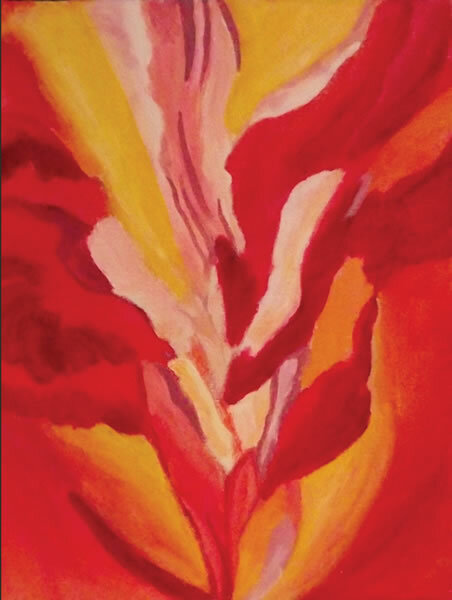 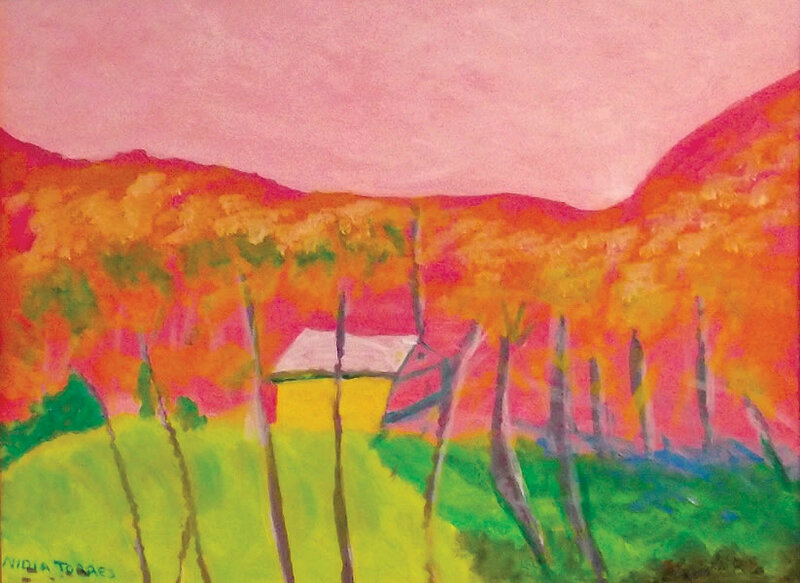 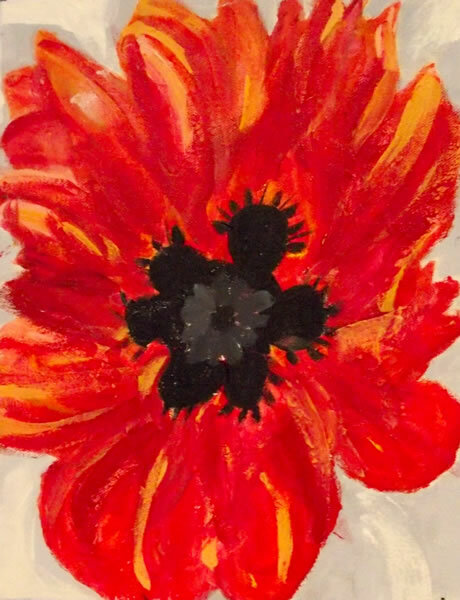 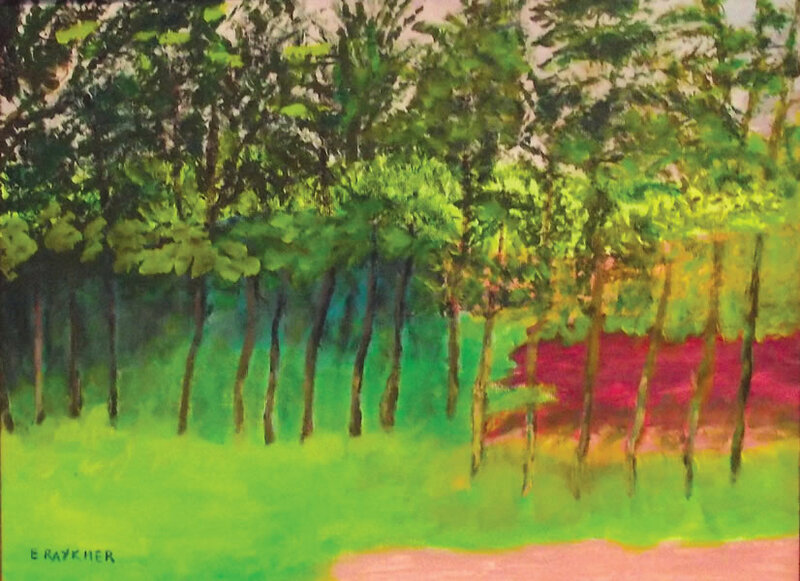 Each of the four classes drew ideas from their local community such as Prospect Park, downtown Brooklyn, the shoreline and created images full of explosive color and energy. 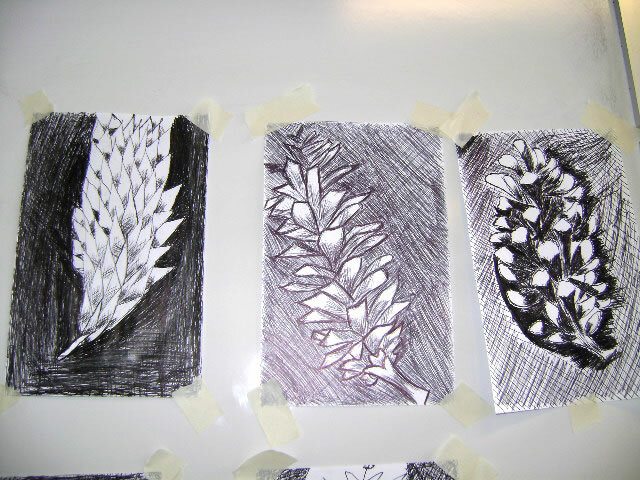 Students met the challenge of enlarging the design onto foam core panels successfully. 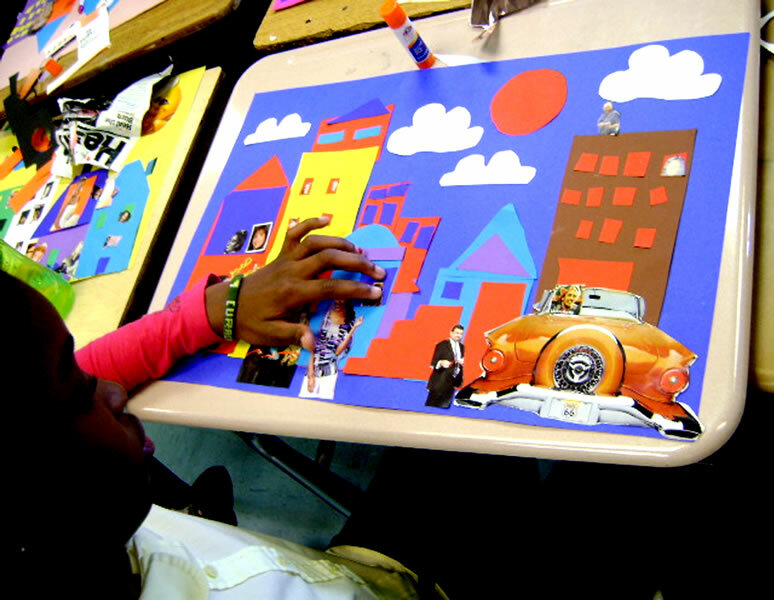 A Day in Brooklyn depicts the students' environment as they see and live it today. 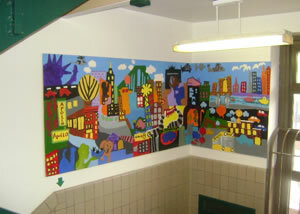 depicts the students' environment as they see and live it today. 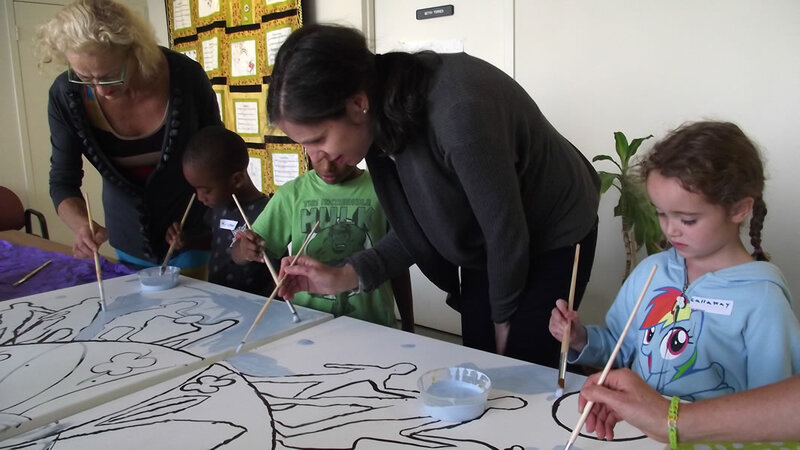 Community Works is a nonprofit arts and education organization founded in 1990 with the mission to bridge schools and communities, enrich educational curricula and celebrate neighborhood cultures and histories. 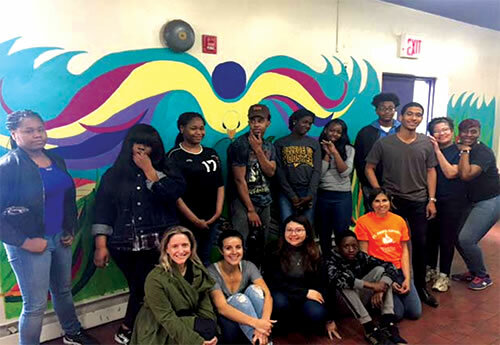 They offer a rich continuum of educational and arts experiences including Making a Difference, which is an arts and literacy program through which students celebrate community history and honor those who serve its people and shape its culture. 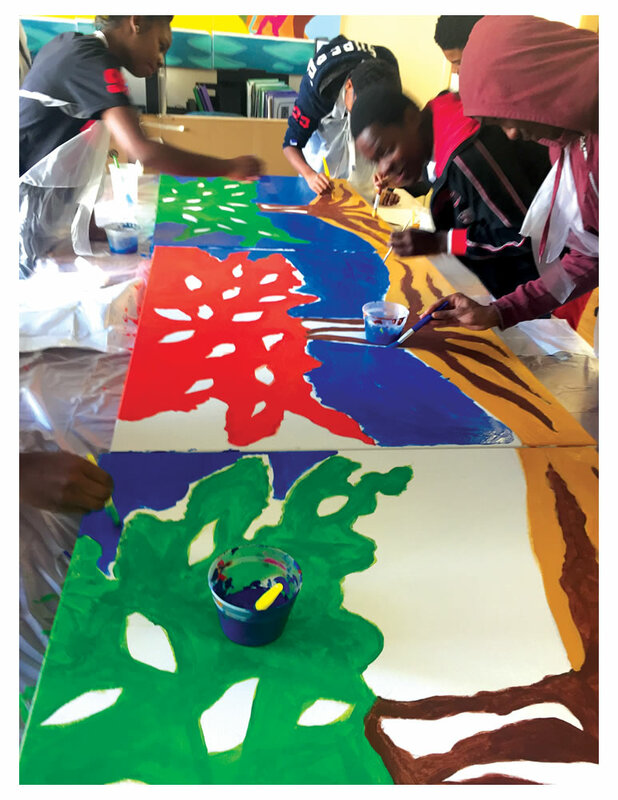 By combining arts, literacy, walking tours, oral history and community-building activities, students have a variety of modes through which to express their learning and vision. 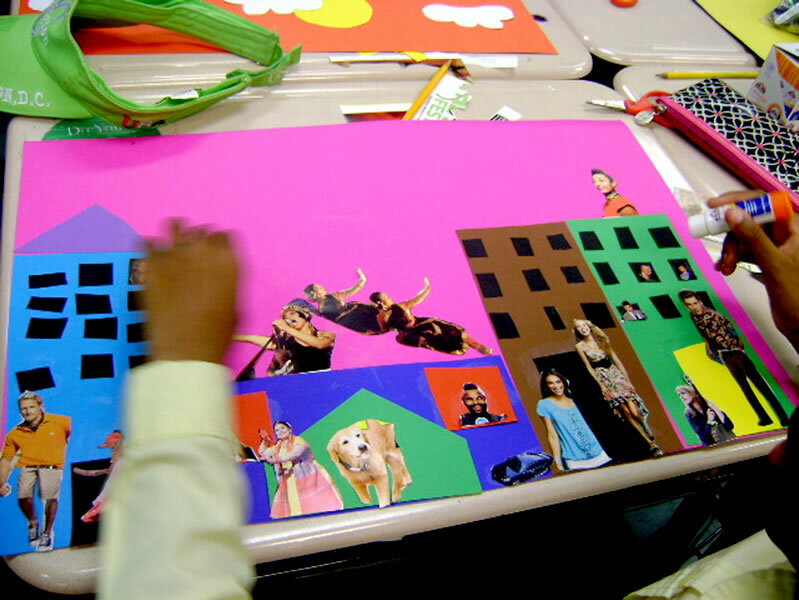 In meeting role models and exploring ways they can participate in community, students discover the many possibilities to make a difference in their world. 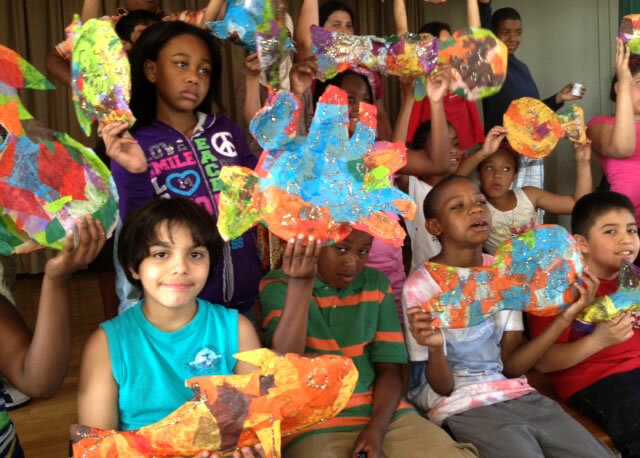 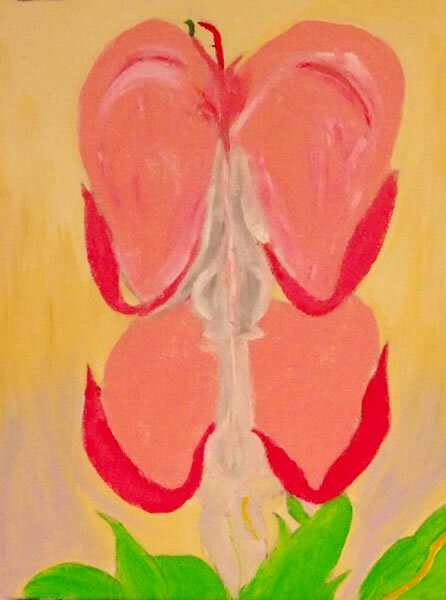 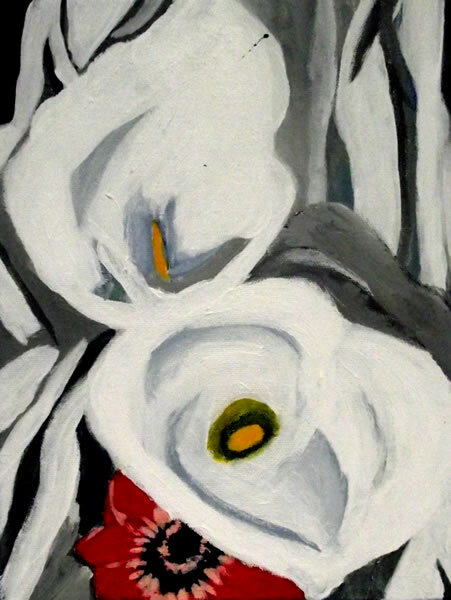 The program model is flexible, allowing for a diversity of themes, structures, and art forms. 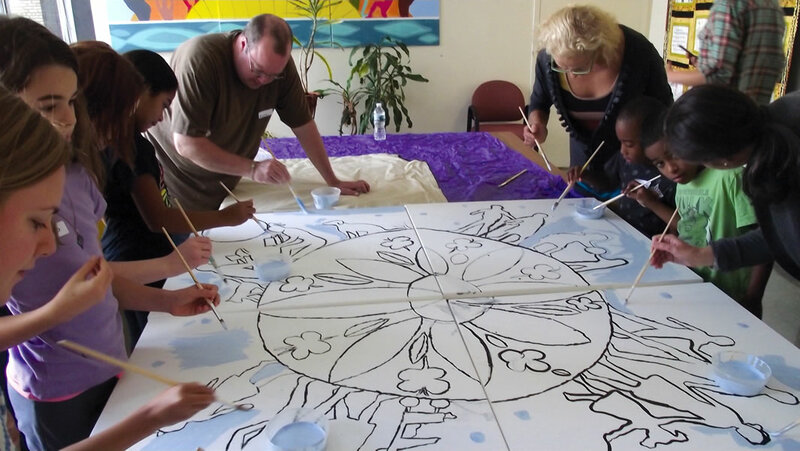 Additional activities may include community service projects, visits to cultural institutions, cross-site sharing, and international cultural exchanges. 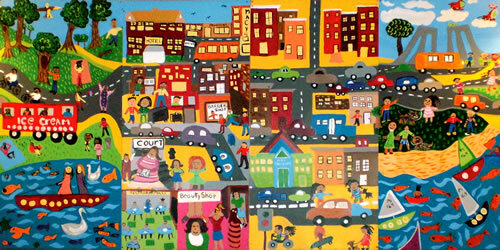 An expansive definition of community can include people drawn together across geographic borders by culture, ideas or endeavors. 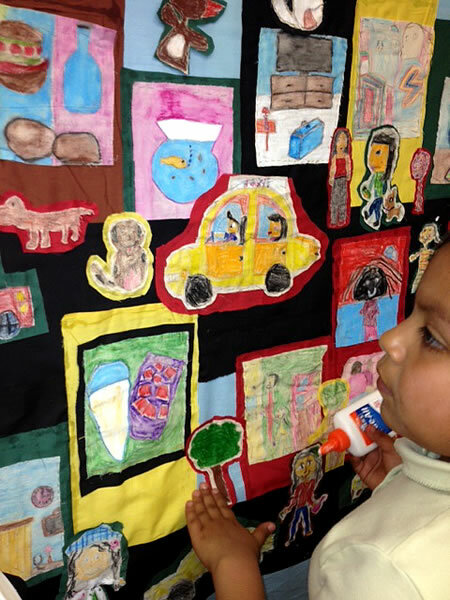 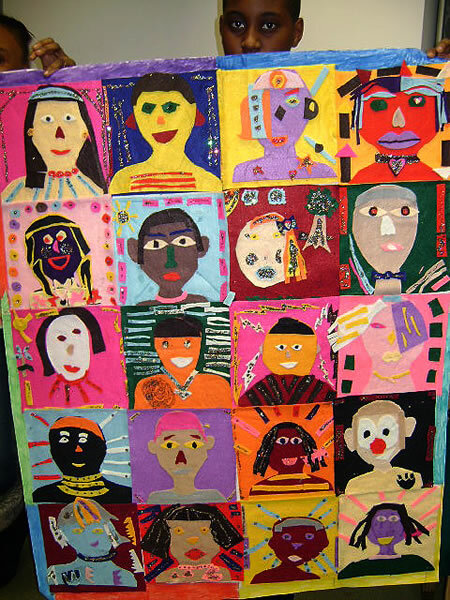 As an Artist in Residence Dominguez joined Community Works and participated in Making a Difference with PS 86, PS 114 and created quilts to be hung in their school walls. 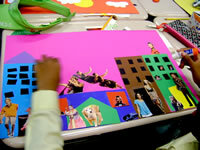 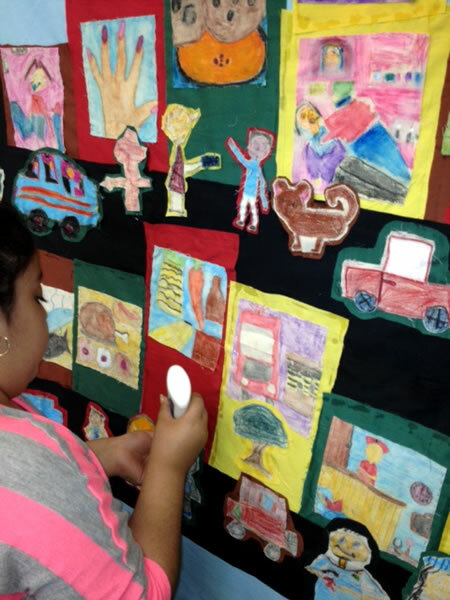 With PS 115 students studied “My Block” by collage artist Romare Bearden and created their interpretation of their block. 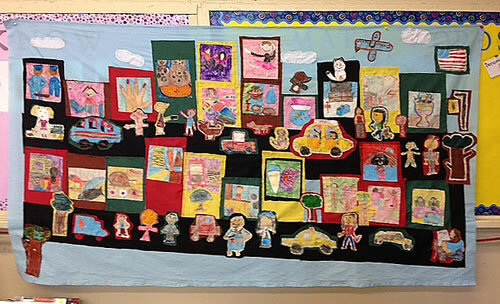 All were elementary schools in Brooklyn, NYC.